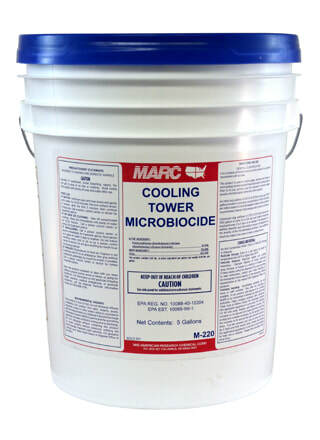 MARC 220 Cooling Tower Microbiocide is a liquid water-soluble microbiological growth inhibitor used to control algae, bacteria and fungi growth in recirculating commercial and industrial water cooling towers. It uses a non-volatile, polymer quat formula to restrict microbiological growth and keep cooling systems in top working condition. MARC 220 is concentrated, so it is economical to use. EPA registered.